When it come to spill response, nothing works like an Sorbent Boom. On land or water, Sorbent Booms are functionally superior to other configurations of absorbents. Since they have the ability to connect together, any length can be achieved. Oil-selective Booms float on the surface of the water and will keep on absorbing until saturated. 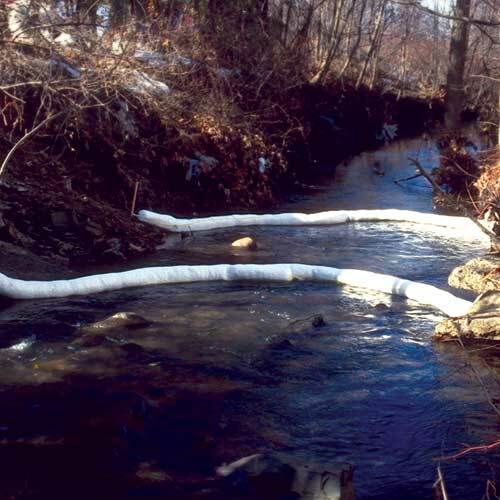 Universal Booms are the answer to land-based spills dealing with chemicals and other water-based materials. Each Boom has rust-resistant clips and rings. Don't see exactly what you want? Give us a call and we'll make a custom size! Available in General-Purpose, Oil-Selective and Acid- Resistant configurations. If that isn't enough absorbent power for you, add more "legs" to your Spyder-Sox™. Use up to eight legs to create the ultimate sorbent.